Most cats can take care of their warmth needs and keep cozy. Older ones with a slowed metabolism, however, can have challenges keeping warm and healthy. Exposure to cold temperatures can also make the cat suffer chronic illnesses hence the need for the best heated cat beds. When the cat is kept warm most of the time, it has better chances of getting healed from arthritis and other ailments. A heated cat bed will ensure it keeps warm and reduces the risk of chronic diseases. 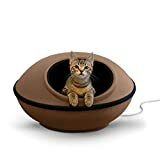 Since the market has so many heated cat bed products, it is not easy finding the best when you need it, hence the reason for this selection to help you choose the best. Milliard Portable Heated Outdoor Pet House - 22in.x18in.x17in. The bed uses an advanced heat-reflecting technology such as the one used in space blankets. The oval lounger is lined with the material that reflects the pet’s body heat back. The faux wool plush and corduroy provides added comfort to the cat in addition to the warmth. 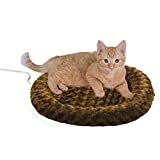 The bottom is non-skid for a safe, snuggly cat bed. The bed does not need any electricity source since it self-heats and is excellent or cats of all sizes. 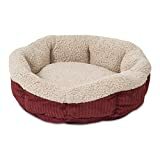 This kitty bed comes with a 4 watt, dual thermostat heating unit buried in the thick polyfill base of the bed.It warms the bed surface 10-15 degrees higher than the prevailing temperature when empty. However, when the pet lies on it, it rises to the pet’s body temperature for comfortable warmth. Its cover is washable, attractive and comes in two colors. The bed is for indoor use only. This K&H cat bed brings a splash of fashion into the home. It is soft and luxurious for the cat. Its overstuffed bolster surrounds the bed providing the kitty all the love you can give. It features an orthopedic foam base for maximum support and comfort to the cat. It is available in two sizes, the 18” diameter with a 4-watt removable heater, and the16 by 22-inch size with a 7-watt removable heater. This K&H heated cat bed is what your cat needs. It maintains the bed surface at about 15 degrees above the room temperature when not in use. However, when the cat lies on it, the bed heats to the pet’s body temperature for comfort and cozy feel. It has a removable heater, and its cover can be machine washed. The cat bed is only for indoor use. There is no better cat bed than this heated low wattage product. It has a simple design, gentle and offers the ultimate comfort to any cat. Its larger sizes can accommodate any cat, and it also provides adequate privacy that your cat will very much appreciate. It features a large access point that makes it easy for the cat to enter and exit. The heater is removable, and the pillow can be washed. 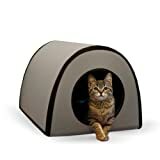 Get your cat or small dog this perfect warm shelter to protect them from the weather elements when they want to stay outdoors longer. 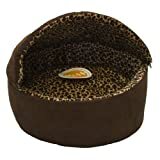 It is easy to set up and features a unique heating design that provides a cozy, warm and dry shelter for the pet to call its own. It features a fitted fleece mat for comfort. Since the house has a dual entry, the pet will not be cornered. This premium cat mat is ultra-soft, therefore, providing the cat with the best combination of comfort, warmth, and durability. It does not use any electricity to keep the cat warm; instead, it reflects the cat’s body heat back to keep it warm even in chilly weather. The mat is reversible to give the cat different style options. This cat bed is among the most popular from K&H. It is ideal for the cuddly pet as it provides a sense of security and comfort all around. It has a dual thermostat 4-watt unit and an orthopedic base for the ultimate comfort. Its cover is removable and machine washable for easy maintenance. Provide your kitty with adequate warmth and comfort using this energy efficient cat bed. The zip together design features a rigid exterior to withstand any use. It is designed to keep the cat warm even in very harsh weather conditions. Half the floor is heated to give the pet an option of heated and normal temperature floor. The pad keeps a few degrees warmer than the ambient temperature when not in use and conform to the cat’s body temperature when it lies on the pad. 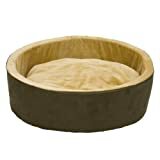 Use this cat bed to provide a warm, safe shelter to more than one cat in an outdoor setting. 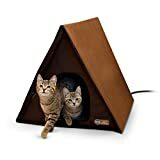 It can accommodate up to 4 large kitties and will keep them warm and dry. Give them a place to call home and has adequate comfort a cat may desire. Everyone desires to keep their pet warm and secure at home. With the best heated cat bed, you can provide your cat with the best environment to be happy in spite of the prevailing temperature. This selection will make it easy for you to pick and purchase only the best product for your cat to enjoy. There is a choice between indoors and outdoors products that will ensure the cat is kept warm in all seasons.